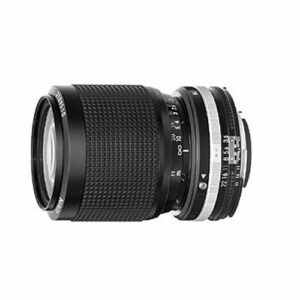 Lens Description: The Nikon AF Nikkor 35-105 mm f/3.5-4.5 is a kit zoom lens for Nikon F cameras. It belongs to the first generation of Nikon autofocus lenses, which had a thin plastic focus ring (the second version featured a broader rubberized focus ring). In macro mode the minimum focusing distance is reduced to 0.28 m, and in so doing a 1:3.5 scale is achieved. This lens came in an AIS manual focus model before it was auto focus, and it is this version that is shown above. The AF versions are optically similar but look different. I have one of these (the AIS) , and its optical performance is decent, if nothing special. It’s a handy range for walking around with a full frame camera. However, a couple of things should be noted. First of all, it is really a varifocal lens, and not a true zoom, and is not even remotely parfocal when you zoom, so you must recheck focus whenever zooming, and the varying aperture, while no problem in automatic operation, also requires resetting exposure if you are shooting manually. The macro feature is limited to a ratio of 4:1, nice and close, but hardly really macro. In addition, it’s quite common for this vintage of sliding zoom to develop a looseness that makes it necessary to hold the zoom in place when shooting other than vertically. Macro mode is rather clumsy,effective only at the widest focal length, and requiring the user to shift a second focus ring, and a drooping zoom on top of that can make macro use a challenge. If doing non-horizontal macro shots, you may have to tape the zoom in place to prevent creep. It’s a decent lens for street photography, but I would not get it for the macro function. Consider that a bonus for occasional use. And if buying blind, make sure you know which version you’re getting, as at one time the AF and MF versions existed at the same time, and serial numbers overlapped. The second generation of the AF version dropped the problematic sliding zoom, and had improved close focusing, but it seems the third generation went back to the sliding zoom. Matthew, this is a very helpful review. Thank you. I am equipping my daughter for a college photography class. Full manual film class with dark room. I got her a Nikon FM2 and was considering this lens as a good everyday lens. Do you have any recommendations given the shortcomings you outline above? Why does the photo of the lens look like my lens (a manual focus lens), yet the description and specifications are of the Auto Focus version? I know it is easy to not realize the differences, when you are in a hurry to meet deadline, but there is a lot of difference between the manual focus lens and the Auto Focus lens. Are they so similar in performance, with the exception of the focus method, that the other details are good for both manual focus and Auto Focus? I was searching for the earlier manual focus lens information, and it seems that the manual focus lens information is no longer available. Does AF Nikor 35:105mm 1:3.5-4.5 lens work with nikon D3300? And how to use it with focus because i am not able to use either manual ir auto focus with this lens. I just received one – a used but good one from another seller and the lens looks clean. I also use a Nikon D3300 and while it mentions AF, it is not autofocus and it shoes MF. But, with practice, you will get use to it and it does not take much time to manually focus it.